If you suffer from IBS you may have been recommended to follow a low FODMAP diet. FODMAP is short for Fermentable, Oligo-, Di, Mono-saccharides and Polyols which are types of carbohydrates that are be poorly absorbed in the gut. This causes alterations in bacterial fermentation and fluid content in the colon (lower bowel) which contributes to IBS. Some people can tolerate FODMAP foods but for those who don’t the results can be a range of distressing and uncomfortable symptoms such as diarrhoea, constipation, bloating and abdominal pain amongst others. GPs, nutrition practitioners and dietitians in addition to stress management will frequently recommend a low FODMAP diet which as been shown to improve symptoms. The problem is that there are not many resources out there to support this diet and the restrictions of low FODMAP makes food choices difficult, this can result in a bland and unvaried diet. The good new is that whilst foods are limited there are many delicious low FODMAP recipes that both you and your family can enjoy. The trick is to use lots of dried spices and fresh herbs. Planning is absolutely key to following this diet. It is also important to seek guidance from a health professional before starting a low FODMAP diet. Here are a couple of low FODMAP recipes for you to enjoy. 350ml of homemade chicken stock (made with chicken bones, carrots and low or FODMAP vegetables). You can also use a gluten free stock cube. In a heavy based casserole dish heat 2 tbsp of olive oil. Add the chicken and fry on all sides until browned. Remove and set aside. Peel and grate the ginger. Add the ginger and dried spices to the remaining oil. Fry for one minute then return the chicken and coat with the spice mix. Add the preserved lemon, olives, sugar, stock and courgettes. Bring to the boil and simmer uncovered for 40 minutes. While the tagine is cooking make the quinoa. In a medium sized pan add the quinoa and 200ml of water. Bring to the boil and simmer for 15 minutes or until cooked through. Drain off any excess liquid. Mix in the chopped mint and parsley. Add the lemon juice and season to taste. When the tagine is ready stir in the chopped coriander and serve with the quinoa. In a large bowl mix together all the dry ingredients, make a well in the centre. In another bowl, beat the eggs and mix with the coconut oil and banana. Pour in to the well and mix together with the rest of the ingredients. Bake in the oven for about one hour until golden. Insert a skewer which should come out clean. Leave to cool for a few minutes then transfer to a wire rack. 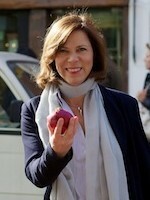 I am a fully qualified nutritional therapist and cook with over 8 years clinical experience. I specialise in chronic fatigue, digestive disorders and weight management. I offer healthy cooking workshops to both individuals and groups of people. My business partner and I recently wrote a low FODMAP cookery and resource book. E is for Endometriosis Painful menstrual periods! How can you help yourself?